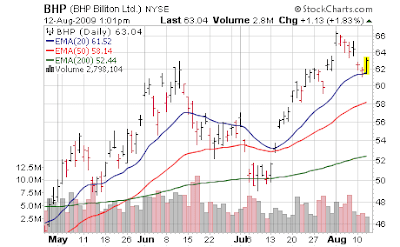 BHP Billiton (BHP) reported today and it is quite an interesting report. This is one of the "big 3" in global mining with their hands in so many subsectors they are a good company to look at in depth to get a gauge of what is happening in their end markets. Considering how bad commodity pricing has been, their earnings report was quite solid (beat estimates of course) and they show tremendous cash flow. I'd expect more acquisitions coming in the year ahead. The CEO says the economy has stabilized at "weak" and right now we are going through inventory re-stocking. Basically the same message we've been advocating; which is why if there is no real pickup in demand (ex government spending) in early 2010, the environment for a "double dip" recession awaits - again this is really just one big recession but massive government intervention will be creating "prosperity" for a period. BHP Billiton, the world’s largest mining company, reported a 65 percent decline in second- half profit after metal prices and demand plunged during the global recession. Net income was $3.26 billion for the six months ended June 30, from $9.4 billion a year ago, That beat the $3.1 billion median estimate of six analysts surveyed by Bloomberg. CEO Marius Kloppers 46, cut output of some products and trimmed jobs after commodity prices slumped in the second half of 2008. The company’s iron ore unit, the biggest earner in the year ended June 30, accounted for about 20 percent of sales. BHP’s base metals unit, which includes copper, silver, lead and uranium, suffered a 52 percent drop in sales, making it the fourth-biggest earner, down from the biggest previously. The price of copper averaged $4,083 a metric ton in the half, compared with $8,023 a ton a year before. The company's pretax, pre-interest profit margin came in at 40.6%, a decline from the year before but still well above the rest of the industry. . In addition to BHP’s proposed $5.8 billion iron ore venture with Rio Tinto Group and $10.7 billion in capital spending this year, BHP would “look opportunistically” for acquisition opportunities, Kloppers said on a conference call today. “Certainly there are things we are looking at right now,” he said. The company was studying some “non-organic growth options” in its oil and gas unit and had spent $95 million this year on the Jansen potash project in Canada. The world economy has stabilized while remaining “weak,” the company said. It will be next year before there is a “clear picture” on commodity demand after customers finish re-stocking inventories, Kloppers said today. “In China … re-stocking coupled with stimulus package spending, fuelled strong real demand in key commodity-intensive industries such as infrastructure, construction and real estate,” it said. BHP added that demand in developed markets remained “constrained”, adding that the global economies would likely emerge from the downturn “less rapidly” than in previous recessions. He added that BHP was not having any trouble selling its iron ore amid reports China is sourcing more from Brazil. “We are selling every gram of iron ore we can produce at this time,” Mr Kloppers added. Since BHP’s acquisition of Billiton in 2001, the mining group had returned $32bn to shareholders via dividends and share buy-backs, Mr Kloppers added.